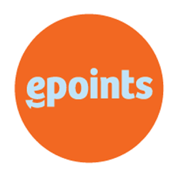 epoints is a widely used points reward platform and network with numerous loyal cardholders regularly rewarded through epoints network. This application is designed to interacts with epoints’ merchant network, which comprises of hundreds of stores across Jordan. Enjoy the countless benefits of epoints and gain access into your favorite merchants that rewards epoints. Become a member, collect epoints, access your balance information, view stores on map and list, take full advantage of the hundreds of offers and deals available with your favorite brands and, restaurants, cafes, service providers and shops.